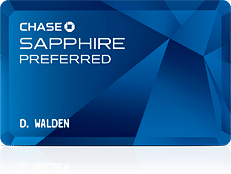 Can You Get The Chase Sapphire Preferred Annual Fee Waived? You are here: Home / Credit Cards / Did I Get The Chase Sapphire Preferred Annual Fee Waived? Did I Get The Chase Sapphire Preferred Annual Fee Waived? Credit card bonuses are something I chase after to earn some extra money with almost no extra effort. In fact, a little more than a year ago I signed up for my biggest credit card sign up bonus ever, the Chase Sapphire Preferred card. At the time Chase required you to spend a few thousand dollars in the first three months to get 40,000 Ultimate Rewards points. These points were worth $400 cash or more than $400 in transfer programs. (Note: Credit card bonuses change often, so this program may not be the same today.) I spent the required minimum amount and Chase added the points to my account. It was a pretty sweet deal. The only catch was there was a $95 annual fee that was waived for the first year and I’d have to remember to cancel if I didn’t want to pay the fee. No one wants to get stuck with a $95 annual fee if they aren’t getting the value out of the card. While I got a ton of value in the first year, I didn’t have any plans to transfer or accumulate a large number points in year two so the benefits of the Sapphire Preferred card weren’t going to be worth paying a $95 annual fee. So I had to try to get the annual fee waived. Did I Get The Annual Fee Waived? I did my research online and found out that virtually no one had gotten Chase to waive the full annual fee. There were a couple success stories of small Ultimate Rewards points bonuses to partially offset the fee, but there were no total offsets. This was a bummer, but Chase knows they have an awesome credit card rewards program with the Chase Sapphire Preferred card and that people need to pay to offset the benefits they offer. So I called and asked them to waive the fee or give me a credit and the person said that they couldn’t. I asked again and she said my only option was to either cancel the card or downgrade to the regular Chase Sapphire card, which has fewer benefits and isn’t all that special. I decided to downgrade, since the downgrade doesn’t affect my credit in any way like closing a credit card would. The downgraded Chase Sapphire card doesn’t have an annual fee, so I can keep it open as long as I want. Should I Have Tried Harder to Get The Fee Waived? I could have tried harder by hanging up and calling again to see if a different representative could help me out, but it wasn’t worth it to me at this point in time. I could have asked to speak with a supervisor or their retention department, if they even have one, but again it wasn’t worth it to me this year. Another reason I didn’t push for it is because if we ever need to transfer points again, Tori can apply for the card and then we can use her free year! We’ll probably do this the next time we have a vacation in the plans that involves airfare or a hotel stay that we want to get for free, because the Chase Sapphire Preferred card and its sign up bonus is one of the better credit card sign up bonuses out there right now. Immediately write down a reminder 11 months from the day your credit card gets approved in whatever calendar you use. I personally put a reminder in my Outlook, Google Calendar AND my cell phone calendar. Even if I quit using one or two of the three reminder options, chances are I’ll get at least one reminder to cancel before the annual fee hits. It also helps to always review every credit card statement, because many credit card companies will reverse an annual fee if you cancel within the first 30 to 60 days of the fee being posted. It isn’t guaranteed, but chances are you can pull it off. What would you have done in my situation? Would you have paid the fee, downgraded to the other card or cancelled the card altogether? I would have probably done the same thing as you, especially if you aren’t getting value from the ‘Preferred’ card. One thing to keep in mind is that even if it took you an hour on the phone going back and forth with a representative or, more likely, their supervisor to get the $95 fee waived, it would be equivalent to earning $95 an hour. That’s not too bad either. I did the same thing with a Marriott card. It is not a bad way to get the points and not pay for them.